This is craft cider at its best. Starting with a distinctive blend of apples, hand-selected then nuanced into a drier taste-profile than most ciders available today, Flatbed Cider’s secret ingredients grow on trees. No sugar or color added. No shenanigans. Ciders have been produced in the U.S. since the repeal of prohibition. Recently the Northwest has become the epicenter of the craft cider revolution. Since 2012, cider’s popularity has grown more than 60 percent each year. The strongest growth is happening in Washington State and Oregon. 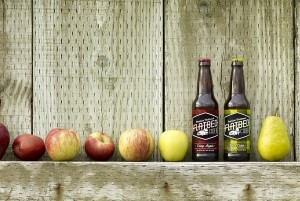 Flatbed’s craft approach creates a unique, uncommonly balanced cider style. Just like the Northwest, Flatbed Ciders are tenacious in spirit with a plucky independence. These ciders are made with local apples picked at their peak and pressed into a mixture that is equal parts crisp and refreshing—in short truly Northwest of normal. Flatbed ferments its hard ciders from local, whole-pressed apples, not apple juice concentrate, and limits the time from branch to bottle to minimize oxidation and maximize Flatbed’s bright, farm-fresh and rustic apple character. Crisp Apple Cider, along with a Pear Cider, are now available at restaurants and retailers throughout Washington State and Oregon, showcasing this new craft cider made from the apples that make the Northwest famous around the world. The special blend of apples going in to Flatbed’s ciders include Jonagold, delivering balance and acidity; Red Delicious, providing tannin structure; and Golden Delicious, bringing a rustic character with a twist of subtle sweetness. Heirloom varietals, like Newtown Pippins and Gravensteins, are blended into the press batch-to-batch to lend a definitive Northwest charm, like plaid shirts and sensible boots. 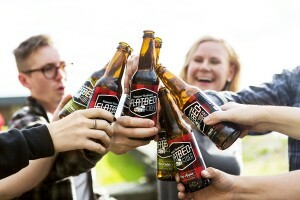 Flatbed’s Crisp Apple Cider has a drier taste profile than most widely-available ciders. The same passion that goes into crafting Flatbed Crisp Apple Cider, goes into crafting its “cousin” Flatbed Pear Cider. As with the Crisp Apple Cider the secret ingredient grows on trees. Northwest-grown pears deliver a burst of crisp, sparkling refreshment with a clean finish. Naturally sweeter than its Crisp Apple “cousin,” Flatbed Pear cider is the perfect choice for taming spicy foods. Another distinction of Flatbed ciders is that cidermakers use champagne yeast during cider fermentation. The particular yeast strain allows the fruit to shine and delivers a crisp, clean finish. Flannel up and enjoy Flatbed Cider at the Seattle Food and Wine Experience within the Cider Section display. See for yourself how Flatbed Cider is Northwest of Normal.